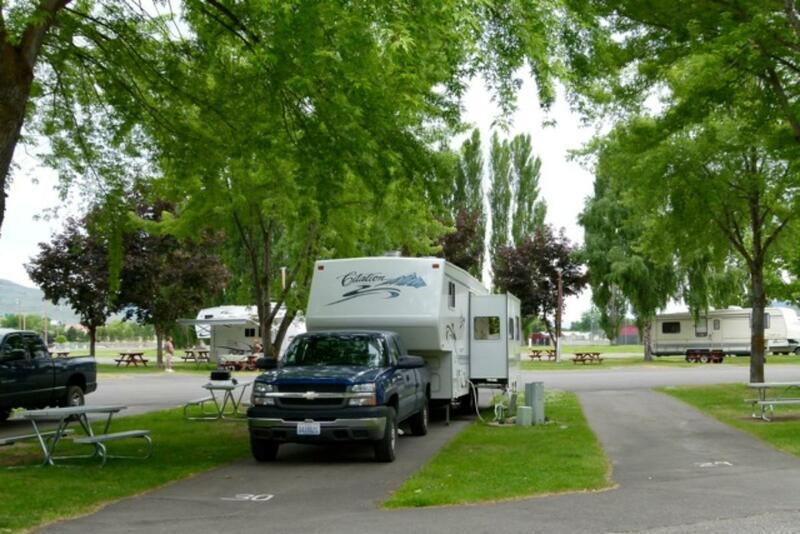 Welcome to the Carl Precht Memorial RV Park which is located in the City owned Eastside Park nestled next to the Okanogan River in the midst of many Catalpa trees that provide great shade. The Eastside Park is a spacious seventy seven acres and hosts many activities and is also home to the Omak Stampede and World Famous Suicide Race. The RV Park has been expanded twice with our most recent improvement being an upgrade to the electrical in our center pull through section. The power was upgraded from a thirty amp to a fifty amp so we can accommodate the larger motorhomes. We now have more than 68 spaces for recreational vehicles. There is also a limited area available for tent camping. While staying in our RV Park, you can take advantage of many activities. If you want to stay close to home, walkers and runners can take advantage of our half mile paved circular walking trail. We also have horseshoe pits, tennis courts, basketball courts, baseball and soccer fields, playground equipment and a dog park. In mid June, our public swimming pool is open and is very refreshing during the hot summer months as is a float on the Okanogan River.